Since its inception and to the current 3.x branch, the extension has been undergoing continuous improvements and fine-tuning. The result is the most stable, adoptable and flexible solution on Magento market. The extensions has been worked to perfection, in and out. You may be sure that every single feature you see advertised, will be delivered. The extension has been designed with your needs in mind. It is equipped with a handy toolset for integration with any custom theme. The extension is designed to rely on Magento's native capabilities to maximum extent, ensuring that the module plays nice with any other component of your Magento. It has been proven that elaborate site design contributes a great deal to brand's trustworthiness (and consequently, to conversion rates). So, it is seamless shopping experience and that elusive "pro" feel that any store owner is striving to achieve. The AJAX Cart Pro extension serves a solid tool in such an endeavor. Give your store its recognizable image! Frequently-seen service screens and confirmation dialogues do not have to be boring or annoying. On the contrary, the module's customizable confirmation pop-ups can be made a great use of. Not only can you excite your customers with the neatly designed splash-screens, but also include interactive elements to guide your clients. Forget complex code adjustments - a simple backend editor will do the trick. Instant Preview function guarantees that the customers will only see the result when it is ready. It's not only the pop-up content that you can easily adjust from the backend. Choose one of 4 animation types, define the pop-up alignment, upload your custom activity indicator - all you need to get your ideal store appearance. Whatever you marketing strategy is, you can adjust the module's behavior to suit it. Separate configuration options for "Add to" and "Remove from" actions allow gently guiding your clients without seeming aggressive. Sometimes, the "one size fits all" approach just doesn't work. For this, we have a remedy. The extension's rule system allows for unprecedented flexibility: you can show special dialog boxes for a set (or sets) of select products, specific Customer Groups or storeviews. So what do I really get? With the extension, you pave your customers' way to the checkout, making their shopping an easy walk rather than an epic quest. Using the AJAX Cart Pro extension together with the below Aheadworks products, online merchants get more valuable insights. Let visitors add items from the featured products block to the shopping cart without page refreshing. Buyers can add related products to cart and select all required options directly on the checkout page. Display pop-up windows with promo information only at checkout & shopping cart. Let customers add gift certificates to the shopping cart without page refreshing. Add items with selected options from category to cart without page reloads. This extension is excellent. I purchased many magento extensions from other companies. But all of them Aheadworks customer support is best. Their support team is professional. They helped me solving conflict between extension & configure with my website perfectly. Thanks for best support. Works really well, very easy to install and doesn't crash with all kinds of extensions. Thanks for the great work that you did it on my project... excellent support! Installation of this extension was easy and then easy to configure for our website. The ability to pop up upsells is exactly what we needed. We had a couple of issues with our theme but the aheadWorks team were great to deal with and sorted them quickly. Highly recommended. Really good extension for store owners who hate constant page reloads - I love it. Though there was a small problem with my top cart, AW support team has solved it outright. Yes, I would recommend AJAX Cart Pro, as well as other AW extensions I am currently using. this extension is very good ,it run in magento ce 1.9 perfect. Initially, the extension didn't update the shopping cart info in my site's header on my custom theme. All I had to do was submit a support ticket and AheadWorks responded within a few days with a fix. They actually created customized code to the extension to make it work with my theme. SUPER AWESOME. This tool will make it much easier for our customers to shop. The service we received with this extension was amazing. Almost an instant reply & our request for customisation was accepted with no hassle. Great company & extension. Good product and even better service! We sell many individual products and I was doubting between cheaper extensions and this one. I decided to purchase the AW-extension and this was definitely the best call. Our theme conflicted to some degree with the extensions and the developers of AW fixed my issues within 24 hours. Thank you very much! With this extension I've reduced the time of my customers for insert products in cart. Now the flow is more quick and I can present crosssell product immediatly. Very very usefull for the customer experience. Installed it, moved it to my theme folder because I am using a custom Magento Package, and it works. What more can say except nice and easy! Works out of the box. Can't wait to customize it will up-sell features. As usual, I wish aheadworks would not default their plugins to spam the admin area with messages. News about other plugins should be opt-in, not opt-out. Purchased this extension and was really happy with it. This is a great extension to add into your magento store, had a few issues with it but the support was excellent. Responded quickly and rectified the issues, which were them related, very quickly and efficiently. We have a few aheadworks extensions on our store, and have a few more book marked. Can not recommend them highly enough. This module is a must-have ! It's really useful to display cross-sell products in the ajax animation. Besides since 3.2.2, this extension works too on IE8. Great, 5 stars ! To be frank, I'm still curious as to why something like this module does not come with default Magento package. 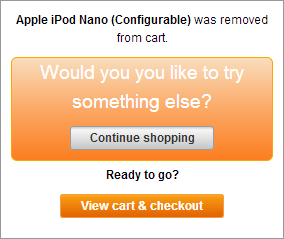 The fact, though, is that it doesn't, so you NEED the proper cart solution. Without it, a webstore looks cheap and amateur. The aw Add to cart extension is solid. I've encountered no issues throughout integration and setup process, the module works flawlessly. I rate this extension full. This is what I was looking for add to cart. Support was good and working superb. Saving time! I've tried another and finally chose this Ajax Cart. The ajax popup window needs to be configured to work like the demo. the documentation on this part could be better, especially if you don't write code. Purchased this and installed fine, had some issues with custom theme, but aheadworks were on the case quickly and sorted this out for me. This should have been in Magento by default! 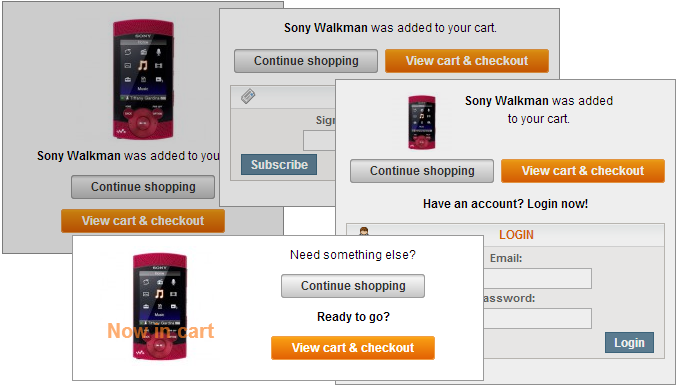 Really, the dynamic add to cart is a must-have feature nowadays, to the extent where a store without it looks plain lame! This particular module not only fills in that HUGE gap, but comes loaded with a massive number of nice extra features. Well-done, and recommended to anyone! Worth its money. Easy to install and our customers really like it. Advise to everyone. This module is great, just install it and it works !!! Even with a highly customized frontend, the extension works with no effort and does the job ! Had a little problem installing Ajax cart pro. After contacting support they fixed it quickly. Turned out to be my own fault. There was some issues with variation products (configurable product). But Support team has fixed these issues pretty much quickly. No more long page loads!!!! Great boost to my Magento Store Performance. A must have for any site with more than one page full of products in any category. Smooth / Fast Installation - AND - a smooth / fast customer experience. This module plus the one page checkout allows for speedy transactions and happy customers. Works fine as described. Support solved some isuues fast and friendly. I had the Ajax Cart Pro installed and it is working great. Configuring it is fairly easy and I can see where this would help save and / or retain customers. Excellent! I installed the extension on a custom theme, and it just works. It's as simple as that. Easy to install, Had some trouble with the order my website loaded some of the files. Submitted a support ticket and they went above and beyond to getting there extension to work with my template. Increases the looks of your website in a nice way and reduces bandwidth usage by decreasing the amount of page loads when customers are adding products to there carts. This module makes life for the customer very convenient. When on the product page, he can buy the product without having to leave the page. He can continue to read the details, or add related products to the cart. Without this module, it is very easy for the customer to "get lost", not knowing how to go back, how to find the related products again. This issue is completely gone when using this module. I have used with Magento CE 1.7.0.2 version. Have some problem with my themes, the aheadWorks team solve it quickly and professionally. This is an excellent product. Although there was a clash with our template, the issue was quickly resolved by Technical support ON SUNDAY!!!! Had a couple of hiccups but my developer sorted it for me, great extension. Great extension that makes the store feel a bit more modern and fluid. It is the little things that counts! Great extension! really makes to ordering process so much easier for the customer and improves conv. rate. Très bonne extension et super équipe technique pour les petits réglages à faire! This team has one of the best Magento developers. We had a small issue when we upgraded to ACP 3.0 and the next day Aheadworks team fixed it. 2 day's later we see version 3.1. That's so great. Upgrade your extensions always to the last version because Aheadworks always makes there extensions better and better. For over 2 years we use software of Ahead Works. And it does work. Installation is easy, support is very well, and fast. Just plain: great. And sure you might have questions or problems, but their helpdesk is great. I surely can say there aint no better extention supplier for Magento that even come close to Ahead Works in quality. As a developer I installed a lot of extensions. This one made my life easier. The features of this extension are great to have on a store off course. A small improvement would be fine to have by default in this extension: besides the image in the confirmation overlay it should have the name of the product, the short description and most important the price block. Easy customizable... Thanks a lot ! I will never buy an extension elsewhere. This extension is perfect. Installation is easily, support is always great and quick. LIke some others already wrot before: improvement that I would like would be the possibility to show related products in the confirmation screen. Maybe you will integrate this in further releases? We have been using this module since our site relaunch under Magento. Our theme is incredibly complex and AheadWorks has helped us through every step of the way to get the module running and working properly. In subsequent upgrades, AheadWorks continues to be there to help us with all of our customizations. I can not express how pleased we are with this module and AheadWorks as a company. They stand behind their products and extend support well beyond most vendors. They consistently have products that do everything they say they will do, install easily, and they work with you in case of any issues. All in all, a great module and a great company to work with. Another great extension that was nice and easy to install, set-up and deploy with 30 mins! Works superbly and our customers already love no page reloads! Perfect extension, very good for increasing your conversion rate! This module makes shopping for your customers easier and more inuitive. Typical Aheadworks Extention, Works Great (as alsways). Would be nice to have the same dropdown effect that is involved in the "My Cart" action on Aheadworks own site, but hey, you can't have everything, not for this money! Magento overall is slow compare to our shopping cart I used before, and it was quite annoying whenever clients click on one product, the system lead them to the checkout page, and it takes time for browsing. With this extension, your clients don’t have to experience such irritation and you can sell more products. And as always the aheadworks support is great! Since I am using JPY for my base currency, when I first used this extension, I had some currency digit issue. But the support team resolved the problem in a couple of days. This extension works as promised. Installation is very simple. Our template needed little customization for additional mini cart at the top bar. They delivered it though there was little delay. I like the following checkout. Things have been much better because of the plugin. Checkout was a breeze for most customers. Great Product and any issues I have ever had, Aheadworks takes care of me. Very good extension and good support! After my unsuccessful attempt to install this extension , I asked the technical support aheadWorks. Now the extension works great. + The possibility of customization for your unique theme. + Flawless work of expansion. + Adequate support (pleasantly surprised that the employee was the Russian-speaking). On the whole, pleased with the work of aheadWorks and already planning to buy some more additions. Ce module est simple et efficace. Facile à installer, c'est une bonne expérience pour le client. Very helpful for our customers. Much faster for those customers ordering more than one product because they don't always have to go to the shopping cart page until they are actually finished. AW customer support was great at helping us tweak this extension. Great extension - great service as usual. An AJAX enhancement like AJAX Cart Pro is a MUST HAVE for any site who wants to look modern and professional. And of course the functionality helps the customer by reducing clicks and screen refreshes. And as usual AheadWorks sales and support team has been great... as usual. Second time in buying this product. For good reasons! Excellent and seamless install. No service required, but if you need some support, AW is all good. We're always a little tentative when upgrading any module in our stores, but the Ajax Cart Pro didn't miss a beat. We've just upgraded this module to fix an IE issue, not only did it upgrade without a hitch, but the issues that we had with browser versions have been resolved... Great work Aheadworks! Thanks. Very nice extension! Support is great too. They did not stop until all was solved. Again: great stuff AW! Nice extension and better support. The extension is great. I recommend it. gives no installation problems, and is easily adaptable to any shop. I found a little bug, and they'd sorted out within 24 hours. Really the best customer service I've encountered in my years of Internet businesses. After installation, this extension had some confilicts with other extensions in our store, but AheadWorks support was great, so they were able to resolve all problems in a quick way. This extension allows my clients users to quickly add items to the cart, which results in more being added. I had a small issue with my theme but support were helpful and responsive and even though they were busy they managed to have the issue resolved within the specified timeframe. Fantastic. This extension is amazing. Purchased it and within a few minutes had it installed and ready to go. I thought this product was going to have a conflict with my onestepcheckout and other extensions, however there were no problems and works great! Other Carts cannot compare, especially when it comes to the quality that Aheadworks provides. The installation went smooth, and the look is so much more professional with our pages not having to refresh every time someone adds a product to their cart. Frankly this type of behavior should be part of standard Magento by now... but thankfully we can get it here! Thanks. It makes our site look more professional, and the perform better. Easy to install and useful of this extension. I really like this extension.. Install was effortless.. The simple improvement of customers not having to refresh the page once they add items to their cart makes a bit difference.. Really adds a classy touch to our site. I tried several others for my customers but the best working and most compatible one is the Ahead ajax cart pro extension. Also the fast and helpful Aheadworks support is a very important point the go with their extensions. We have purchased multiple extensions from aheadworks and as always they are working perfectly. The Ajax Cart Pro has made the lives of our customers much easier and we see better conversions than without it. Even the smallest things makes a difference. The product works great but I'm most impressed about their customer service. I was using a theme that had three types of carts that were displayed on the page and by default, AJAX Cart Pro only updated two of them. I gave them my login information and they had it fixed within a few days. Very impressive. They could've easily made this a big deal and try to get extra money from me but they did it for free. The extension works as it should and allows me to make changes to the code without hassles. Good stuff. After installing this my customers started saying how much easier it is to shop. And the site feels so much more snappier. Help customers make purchases more easily. This extension is great! It was easy to install and the support team quickly helped me work out a bug that was specific to IE9. Our average cart total has increased by 15% since installing this extension. This module is really good. They've covered pretty much every angle, and the support to fix the very minor issues that we had was superb. Regarding AheadWorks Support (email and chat), and this extension, all I can say is: P-E-R-F-E-C-T . I will buy more extensions from them, and also ask for customizations for my site. A very nice and good working extension. The support is also perfect. Great products & SUPERB service! I ordered the Ajax cart pro for our shop. Needed a tiny bit customization due to our shop being in Danish language. They did this for us free of charge! Bought from AheadWorks before and we will do it again to enhance our shop with quality extensions. Pavel did great in communicating with me about our needs. This is a must have extension for Magento. As with all of Aheadworks extensions, it is so easy to use and customise yourself with basic tech knowledge. Looking forward to future upgrades to this extension. Everything just works the first time. Of all the extensions I have purchased, I have not once had to contact them for support as they just work first time every time with no issues. Keep up the great work! I bought a bunch of extensions from Aheadworks, and I saved this one for last, because honestly I was worried that something would go wrong and interrupt my customers' orders. But I installed it with no problem on the first try, and it is just amazing! It really does make a big difference in the user experience. Most of my products are configurable products. I was very pleasantly surprised that the Ajax pop-up box displays the configurable options. It makes ordering much easier and much more enjoyable. Cool extension - but what about bought together? I really like this extension and want to buy it. I like the idea that people can buy the product direct from the category and even select the sizes. However I dont like that we loose the upsale possibility of bought together module. If it could work together with this module I would not hesitate to buy the module. Great product, sleek easy to use, and love the customizable animated status gif when adding a product to cart! Très bon produit, installation facile, support en ligne sur le site accueillant et réactif, installé en 2 minutes. Je me félicite de mon achat. The support team were great in helping customize this extension to work on a clients site with other 3rd party extensions installed. No more annoying "back" clicking! Perfect extension, best-in-class support. Ahead really rocks! The product works exactly as advertised and provides needed functionality. My custom theme needed some support in order for it to work. The technical support team is wonderful, they worked with me to get through the problem and provided prompt and thorough feedback. Once again aheadWorks knocks it out of the park! excellent extension. easy installation, looks very nice. worked first time with add to cart. Because of my theme, it didn't display at first in the cart page until i'd created a custom.js as perfectly explained in the readme file. Thanks. I got this extension for a site with slow "add to cart" functionality. It does improve the user experience and allows less page loads. At first the extensions did not work but Alex replied quickly to support requests and within a couple of days the extension was working superb. A possible suggestion/improvement might be the possibility to show related products in the confirmation screen. This could increase sales. After installation, it didn´t work with our modified blue theme. Due to the excellent mail support it now works like a charm after just swapping two lines of code in head.phtml. We had some problems with installing this module because of another extension. The people at aheadworks quickly solved everything making code changes in both extension (during the holiday season!) and now everything works like a charm! Increases the looks of your website in a nice way! They helped me find a bug in my theme that was causing a few different issues. The extension works as advertised and was exactly what I needed. THANKS! Very easy to install and set up! 1. A configurable timer to close the pop-up - maybe with a visible count-down. 2. Disabling the pop-up for the shopping cart when customer adds cross-sell products. The installation of this module went very well and smooth. Just followed the steps on their website and it worked. I did notice an issue which I reported during the weekend. It got solved on Monday, mind you they contacted me during the weekend for login info. Great extension, first-class service. We use a spin-off the modern theme and do not notice any problems updating the quantity on the checkout page. × Profit from the techniques implemented in Magento 2 AJAX Cart and Magento 2 One Step Checkout to arrange the easiest way to a successful purchase. Use automatic related products to increase the revenue by extra promotions on the add-to-cart step. When installed, it takes only three options to set up Magento 2 AJAX cart, which could be done in under a minute. After that, the store is equipped with an add-to-cart pop-up, which allows to select all the necessary options and add products (even configurable ones!) to cart without leaving the catalogue. John’s got a new apartment, which is all good, except the kitchen is literally empty and there is barely a fork. John makes a list, goes online, and visits the first store he finds. Now, the best case scenario is that he will buy the bare minimum and later get the rest of his list elsewhere. He might quit altogether. At the very least, he’ll be scarred for life by this negative experience and there is very little chance he’ll pick this store next time. This is the exact problem we solve with our Magento 2 Ajax Cart Pro - letting people shop with as little interruption as possible, eliminating exit points, and creative a positive shopping experience that customers came to expect these days. Apart from the essentials, admin may add a short product description, product rating, and a number of product reviews to add-to-cart pop-up. Increase your average order value by offering cross-sells after adding products to cart. Related items generated automatically can be displayed inside of AJAX Cart Pro confirmation popup with the help of Automatic Related Products. How AJAX Cart Pro Magento 2 extension beat the competition? Thanks for the extension you provided, works fine and I can install it without a problem. Support was very good. They even do a little bit of customization work for us at no additional charge. They added SKU and Tiered pricing to the quick view popup for us and it made the client happy. I also appreciate your customer service and will continue to look at your products for future needs. This added a much needed usability feature to our Magento store. Customers can more quickly browse and add products to the cart, without the slower back-and-forth process from the product listings to the detail pages. The extension is nicely configurable and above all, the support team is very prompt and helpful. Overall implementation is pretty nice and the extension worked fine with our custom theme with just minor css tweaks. The support was exceptional, I'll recommend Aheadworks. Thank you team! There is a problem in Magento - when you add something to cart, it often does not refresh it immediately, which is weird. This module solves the problem just perfectly and noticeably improves a shopping experience. I definitely recommend it for every merchant, and also for developers, as the code is very good. Which option types are supported? 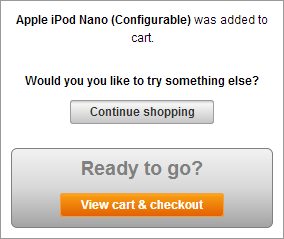 If a product has custom options of unsupported type, upon clicking on Add To Cart button a popup will not be displayed and a customer will be redirected to the product page.